In his Sunday Baseball Notes column, the Globe’s Nick Cafardo wrote that it is now likely that the Red Sox will pick up the $13.5 million 2017 option for Clay Buchholz. At the risk of giving at least one RedSoxLife.com writer a heart attack, I say it is a no-brainer for the club to do just that with Boston’s biggest tease outside the Foxy Lady. Buchholz, who appeared to be headed out the door for much of an incredibly disappointing 2016 season, has been good since he went to the bullpen and figured some things out. Pitching exclusively from the stretch, Buchholz put together three solid starts that could have been even better if manager John Farrell didn’t mess them up. He has also been solid, if underused, in his relief appearances. “If Buchholz can give the team multiple innings late in the game and eliminate the need for situational matchups, it’s like finding gold,” Cafardo wrote. That is a pretty strong comment about a pitcher who, to most Red Sox fans, has been the very definition of fool’s gold since throwing a no-hitter in his second Major League Start in 2007. Every time Buchholz (pictured) starts looking like a Cy Young winner, and he has on several occasions, he strains an eyelid and the season is shot. Jennifer Warner wrote a great account of the roller coaster ride Buchholz has taken Sox fans on over the years. You can read that here. 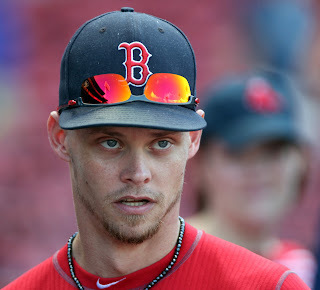 Does Buchholz’s recent resurgence warrant a $1.5 million dollar raise for his way-to-high $12 million salary in 2016? No way. Not even close. You would have to be crazy to make that argument. That is, unless, you are a franchise that can afford to pay the Paw Sox more than Pittsburgh can pay its Pirates. The Red Sox have the luxury of being able to afford a $13.5 million swing man, and they should. Actually, the Red Sox should put Buchholz back in the rotation. Seriously, who would you rather take your chances with now, Eduardo Rodriguez, Drew Pomeranz or Buchholz? Call me a dreamer, but I’d put the dollar in my mouth up for Buchholz any day when given that choice. We might be talking about the Red Sox taking two of three from the surging Royals had Buchholz gotten the start Sunday night. Most Sox fans focus on the negatives of Buchholz, and there are a great many of those. However, I focus on the times when Buchholz has come through big time for the Red Sox while putting the team first. Remember Game 4 of the 2013 World Series? To me, that is the signature game of Buchholz’s career with the Red Sox. I don’t look at the no-hitter or the many gems that he put up before suffering a mysterious injury in 2013. I look at the four-inning start Buchholz gave the team when he was clearly injured. His fastball didn’t have much on it, but Buchholz still went out and threw 66 pitches, giving up three hits and one unearned run. Buchholz took the ball because his team needed him, and his teammates knew how big that performance was. Without that start from Buchholz, that championship banner might be hanging in St. Louis. When Buchholz was moved to the bullpen this year, he didn’t demand a trade or pout about the situation. Instead, he worked to get better, and he did. Again, he put the team first and helped the team. The pitcher deserves praise for that. He does not deserve a raise to $13.5 million, but giving money to people who don’t deserve it is something the Red Sox do well (see Pablo Sandoval, Rusney Castillo, et al.). The Red Sox can afford to overpay for one more ride on the Buchholz roller coaster, and they would be crazy not to.